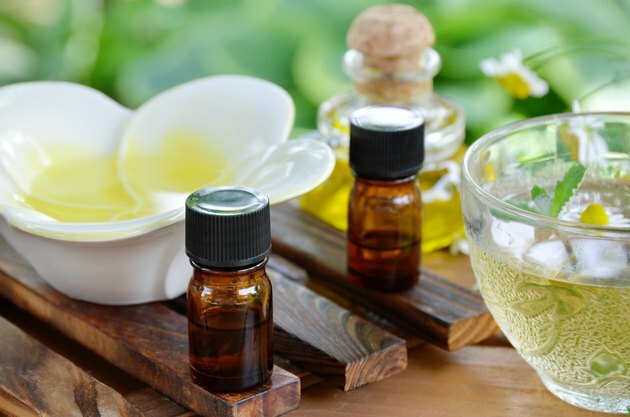 According to a three-year study by the University of Western Australia, tea tree oil has been found to be an effective alternative topical treatment for precancerous non-melanoma skin lesions and even has had success in shrinking tumors in mice. If left untreated in humans, precancerous conditions such as Actinic (solar), Keratosis, and Actinic cheilitis, may evolve into full-blown cancer, so using a formulation containing tea tree oil might provide some protection. Consult your health-care professional before trying any kind of alternative approaches to medical conditions. Tea tree oil is an oil derived from the melaleuca alternifolia, a plant indigenous to New South Wales, Australia. The oil is created through a steamed distillation process of the melaleuca’s leaves. Other countries claim to produce tea tree oil, but the pure product comes only from Australia’s plants. Tea tree oil is for topical use only and is toxic if ingested. While individuals sometimes use tea tree oil with their favorite toothpaste, it is not to be swallowed. Even if tea tree oil is applied directly to the skin, irritations that might cause allergic contact dermatitis have been reported. Although there are still definitive tests needed to determine just how effective tea tree oil actually is, there have been several other tests that prove its success. Tea tree oil is a natural preservative and has many antimicrobial properties. It is useful for a number of skin conditions, including acne and other skin irritations, athlete's foot, fungal infections and insect bites, and is even added in small amounts to toothpaste to prevent dental problems. It acts as an antifungal, anti-viral, anti-inflammatory and antiseptic among its properties. There is anecdotal evidence that tea tree oil stimulates the immune system and helps repair skin lesions by forming new scar tissue. Precancerous skin conditions are usually caused by too much sun exposure and the occurrence of more than five severe sunburns. Actinic keratosis is the most common precancerous skin condition, forming lesions and crusty bumps of different colors on skin that has had too much sun. These bumps may bleed, itch or become inflamed. Actinic cheilitis causes cracks and lesions on the lips that is also the result of too much sun and can lead to cancer if left untreated. In a study by the Tea Tree Oil Research Group at The University of Western Australia in the early 1990s, it was discovered that using tea tree oil as a treatment for precancerous and cancerous non-melanomas had positive results. A three-year study found solid proof that tumors grown under the skin and surface lesions in mice, when treated with a tea tree oil formulation, were inhibited in further growth. Regression occurred within a day and three days later tumors were not detected. These results have spurred researchers to patent new creams that mix with the tea tree oil to lessen the harsh effects of the oil against the skin so that the oil might effectively suppress and cure the precancerous lesions.